I love my rug. I love, not only the design, but also the colors, as it doesn't show dirt. It actually doesn't show anything because of the pattern. 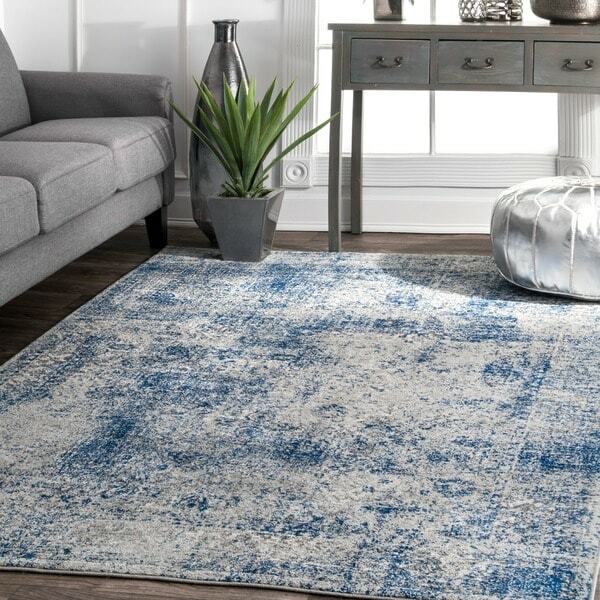 Designed to resist shedding and clean easily, this distressed blue rug is a great way to freshen up the decor of any high-traffic area in your home. The rug's pattern is rendered in a variety of blue shades for a decorative vitality. Great area rug for a great price, and looks terrific in our living room. It’s very well-made and softer/more plush than expected. The rug also took no time to lay flat, and has no wrinkles or folds like other rugs purchased in the past. This is not necessarily a negative, but there is a bit more blue in the rug than appears on the stock photo. Either way, no regrets with this purchase and I would recommend this to anyone! Very beautiful blues and grays! 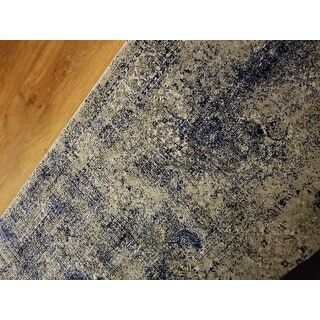 This rug is a very soft distressed looking rug and the colors are perfect for the master bedroom. We are very happy with this rug, love the colors and the feel. This rug is exactly as pictured, the coloring is represented perfectly. I have it in my bathroom where there has since been a major leak, which, as it turned out, didn't discolor the rug in any way. A high quality product. This rug is amazing! The colors are just as beautiful as seen online, it's soft underfoot, and better made than expected. I turned it upside down in the sun to allow it to relax, then brought it in and placed a rug pad under to keep in place. It's exactly what I was looking for! Excellent quality rug. We bought this rug for our living room in 8 x 10. 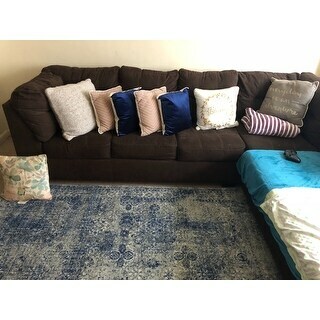 The rug lays flat on its own and doesn't need a non-slip pad - it stays put with our couch on top. Gorgeous colors, definitely more blue in the rug then shown in the pictures, but we love the pop of color. Awesome! Great Quality with a good price! 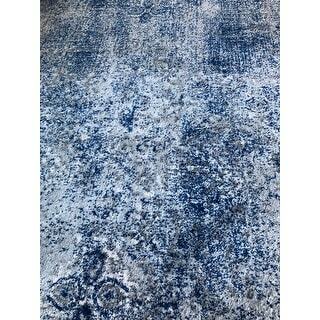 This rug is true blue and grey! I love it! 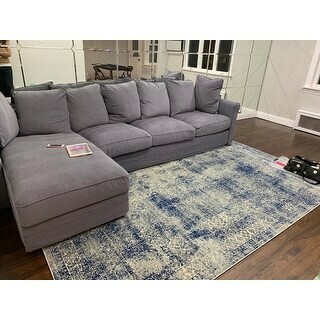 I was looking for an area rug to pull my blue cushions in my dining room with a grey sectional ! This did the trick! Great quality, awesome price . Shipped fast. I just ordered the runner for my hall area as well. I don’t think there us anything boring about it. I have grey walls and have had a few decorators tell me this was a great choice with the grey walls I would highly recommend this product! 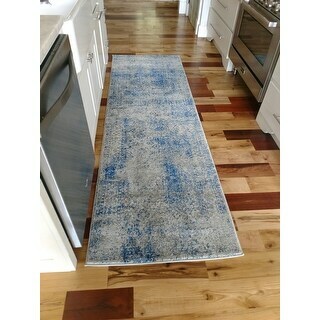 Option: 5' x 7' 5"
I bought this rug to add warmth to my kitchen. The distressed blue/grey is a perfect blend to add some color and not be over-powering. It's both comfortable and durable, in my high traffic area. I love it! You get exactly what you pay for. 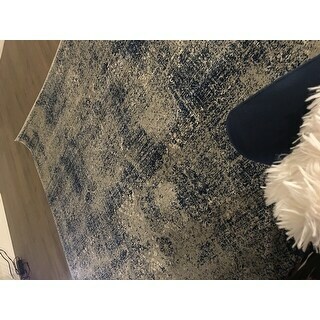 Low pile (easily allows doors to be opened over this rug), weathers well (the synthetic fibers are strong), holds its color extremely well (I have it in a high traffic area where people are constantly wearing shoes and walking over it). It is not soft, and does not get dirty easily. I love this rug. I purchased this for a client in a house I'm doing interior decorating in. The color is great and then the texture is wonderful. It is a wonderful accent piece to an office space. The quality of this rug is absolutely great. I have had nothing but wonderful experiences with customer service this website has to offer. The quality of their merchandise is top of the line. The colors are always true to the pictures. I will continue to purchase items from this website. Great rug,true to color as shown. 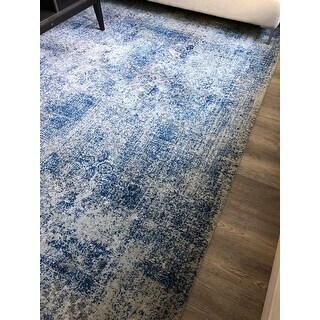 This rugLooks great with our furniture. However, there are definitely more grey patches than expected,And we were hoping for more white than there is. Beautiful, soft and the right color blue that I wanted. Easy to style and adds life to the living room with the right mixture of royal blue, light gray and white. The rug came in just as the delivery instructed. It was in excellent condition and was exactly what I expected. I will continue to purchase from overstock! This rug really brightens up the hallway. Lovely! Love this rug. It looks great with the grey linen dining set I also purchased through Overstock. The colors are perfect with grey and blue. Very soft. Great purchase! Love the color and the feel. Purchased two rugs to create a 9x24 look. It adds so much color to the white walls. Looks great with a blue sofa and beige chairs. Perfect rug and has held up great. Didn't like it. Too much blue, it doesn't look like the picture. Love my new rug! It’s goes perfect with my couch and pillows. It’s a really good quality rug. I have this rug under my coffee table, matches my modern look going on in the room. It has really nice colors and good size for most of the rooms. The colors are perfect I just wish the thickness of the rug was more fuller.... but I'm happy with it. "What is the pile height of this rug?" "I am considering this rug for an office space. Is the weave tight enough for an office chair to roll over the rug easily?" The pile height of this item 0.50 inch makes this item easy to roll over with office chair. "Does this rug have any camel/dark beige in it? My couches are camel and the walls are light gray, and i want to make sure this will go well and not clash." Needing new rugs in my living room. "Does this come in a 6x9? " "Is the blue in this rug more navy or teal? I've got some gray wicker furniture in a sunroom with navy blue cushions and am wondering if this will match. " The monitor I am using shows more of a Navy blue. It definitely a navy blue. The blue is definitely more navy. I just held a navy blanket up to the rug and it matched perfectly. "Don't think it does, but does this rug have a "looped" pile? I have cats and they destroy any looped carpet. Thanks!"